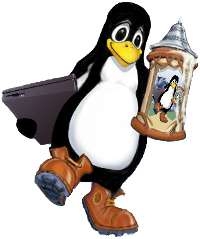 The name Linux Bier Wanderung comes from the fact that the first event was held in Pottenstein in Germany (in 1999) in the form of a traditional German “Bier Wanderung” for Linux folks, and since then the group has visited many additional countries and regions. Somewhere in the region of 80 people attend the annual event, and set up a computer network in a local hall, which is hired as a base for the week's activities. During the course of the week, several members of the group give talks and presentations on topics such as Open Source software on Lego Mindstorms robots, the Welsh language, and the internals of the Linux firewall. Alongside all this technical activity, the group organises walks and excursions in the local area — previous events have included a visit to a radio telescope, a three-country walk in the region of Schengen, tours of a local cave system, and for the more active members of the group, climbs in the hills and mountains nearby. In the evenings, the group enjoys visits to the local restaurants and bars, as well as holding an International Potluck evening, where groups from different countries prepare examples of national dishes and unusual foods, for the diverse international visitors to the event to sample. LBW is an entirely volunteer-run event, funded from a combination of donations amongst the attendees towards the cost of the hall and Internet access etc., together with some sponsorship from companies who are keen to promote the international meeting of Open Source users and developers, in an environment of open access to expertise, good food, and the local countryside. Visitors to each year's LBW arrange their own accommodation and travel to the event (although the website provides plenty of assistance with both of these, and lifts are commonly organised amongst visitors travelling from nearby places), and there is no set fee for attendance. This enables students on a low budget to join in just as easily as Open Source consultants, although the latter are generally expected to contribute a little extra to the costs of running the week-long event. If you'd like to join in with this year's LBW, please register your details, or if you'd like to make a contribution to sponsoring the event, please contact the organisers. Discussions about the event (and any number of other arbitrary topics) take place on the mailing list, and people can also be found on IRC channel irc.oftc.net #lbw.